‘Good carbohydrates’ has almost become an oxymoron amongst many seeking optimal health. Unrefined or whole grains such as brown rice, quinoa, buckwheat and oatmeal contain fiber, minerals and vitamins so they nourish the body, provide energy and are filling. Brown rice contains manganese, phosphorous and B vitamins. If you are a very active person, like myself, you especially need healthy carbs to sustain your energy levels and lifestyle. Many experts say carbs are brain fuel too. 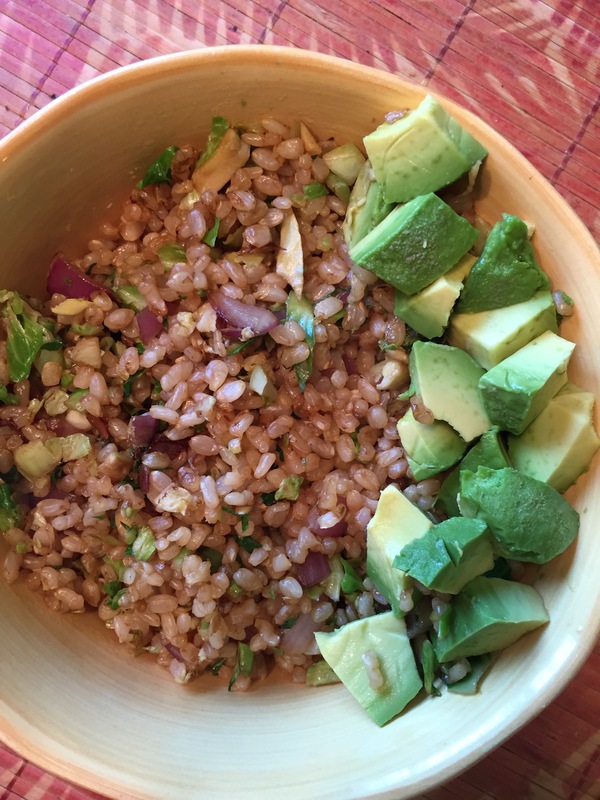 Brown rice is not only one of my favorite whole grains, it’s one of my favorite foods period. I particularly like the short grain variety. Many people, in an effort to lose weight, eliminate carbs from their diets. The refined and processed carbs that are lacking in fiber and are nutritionally void such as white bread, donuts, cakes and refined pasta are basically empty calories than can cause weight gain if not burned up. They are easy to over consume because they are not filling and its easy to eat large amounts. I can easily enjoy plain brown rice. That’s right, no oil or seasoning. Sometimes I’ll spice it up a bit by adding sea salt and hot sauce. 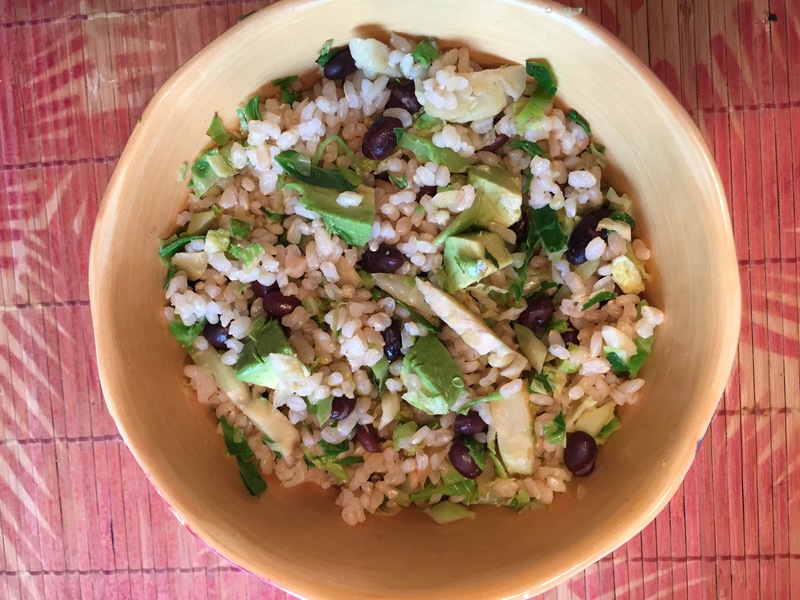 I’ll admit that’s not a very balanced meal so I’m sharing three easy ways to eat brown rice that anyone can make. Brown rice takes longer to cook (about 45 minutes) than white rice because the fiber-containing husk is still intact. I’ve never been good at cooking rice the traditional way. I either burn it or it’s soggy. My rice cooker has been a lifesaver. I strongly recommend one. It even turns off automatically when the rice is ready. I’ve had perfect rice ever since. One cup cooked has just over 200 calories, 4 grams of fiber and 4-5 grams of protein. In a meal I typically eat about 1 1/2 cups of cooked rice. Heat the brussels in a frying pan with a splash of water and 1/2 teaspoon of coconut oil at medium to high heat for about 5 minutes. I call this dry frying. It soften the vegetable and the oil gives it a nice flavor. Mix it with the rice, beans, pico and avocado. Season with salt and hot sauce. This recipe is best with left over cooked rice that has been refrigerated. Heat the brussels and onions in a frying pan with a splash of water and 1/2 teaspoon of coconut oil for about 5 minutes. Add the rice to the pan and add a few dashes of tamari or soy sauce. Cook for another 3-5 minutes or until rice is hot. Remove from pan and add avocado. This recipe goes well with chopped peppers and carrots too but I wanted too keep it really simple. Edamame would be a great addition too for added protein. Follow rice cooker directions and begin boiling rice. Replace 1/3 cup of the water in the directions with coconut milk. When about ten minutes remains for rice to be finished mix in the kidney beans. Season with salt to taste. Eat with veggies of your choice. If you have fresh thyme place it in the boiling rice and discard before eating. I hope you try some of these simple dishes and are inspired to create your own. Facebook is detrimental to health. Is it really?